Tis’ the season to be lit up like a Christmas Tree! Is this the cutest Christmas sweater ever or is this the cutest Christmas sweater ever? 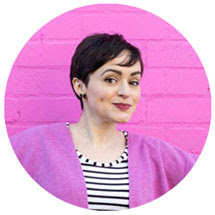 If you fancy making your own, Marnie from Happy Fabric has created a quick and easy tutorial for how to upcycle a top using vinyl sheets that you cut and press onto your garment. Enter your DIY into our Xmas Sweater Contest if you want a chance to win some amazing goodies! 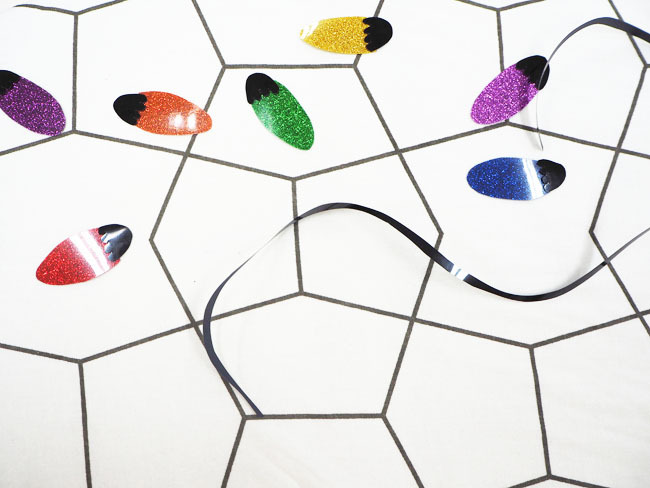 1x A4 sheet HappyGlitter for the baubles in each of the following colours: red, orange, gold, kelly green, royal blue, lavender, egg plant. 1x metre of HappyFlex in black for the wire and top of bauble. 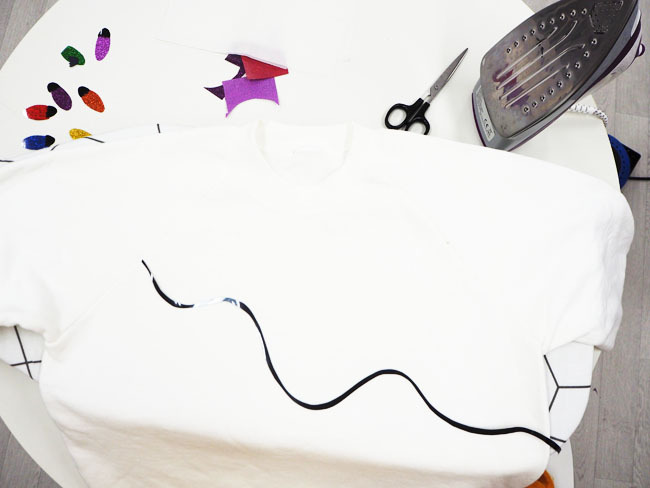 Lay out your sweatshirt and plan out where you want the wire of the lights to go. 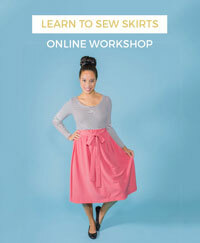 For this one we will be creating a squiggly line going from the right shoulder down to the waist on the left. Once you have an idea, lay the black vinyl across the jumper facing down. 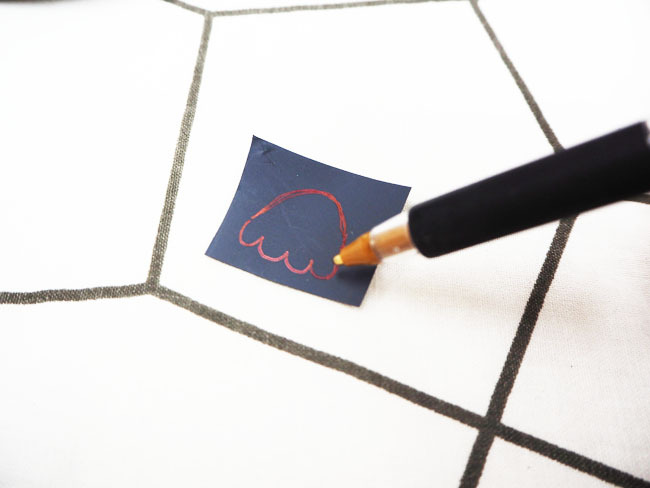 With a pen begin to draw your squiggly line. Remember when you turn your vinyl over to be ironed it will be in the reverse. Once you are happy with line you have drawn, draw another line running alongside your first line about 5mm (1/4in) apart, then cut it out. Now you have cut out your wire, you need to make your glittery baubles. I have used seven different colours. 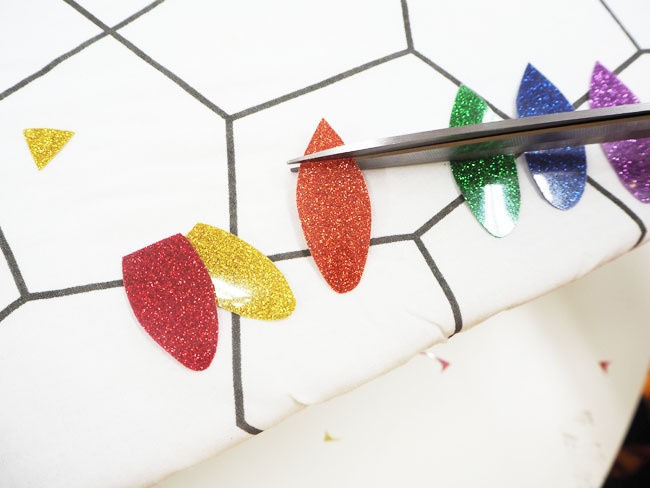 In the corner of each colour, cut a leaf shape about 2cm (3/4in) wide. Once you have your leafy shape, at one end cut it into a curve, to get rid of the pointy end. On the other end cut a straight line. This will be where you will create a little ‘hat’ for your bauble. It will act as the part which attaches to the wire. I am unsure of the technical term so we'll call it a ‘bauble hat’. To create the ‘bauble hat’, lay your glittery bauble upside down on the back of the black vinyl. 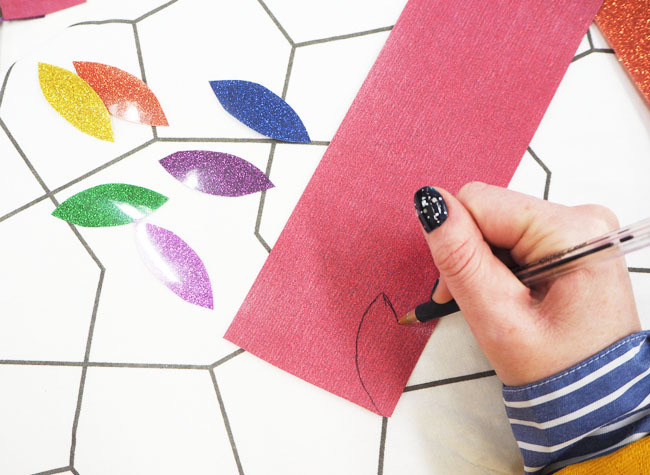 Where you have your straight line, draw a new curved end from the corners of the glitter vinyl. Add a scalloped line across the bottom of the curved end, this will be used to overlap the glittery bauble to create the ‘bauble hat’. Now it’s time to apply the heat transfer vinyl (HappyGlitter and HappyFlex). 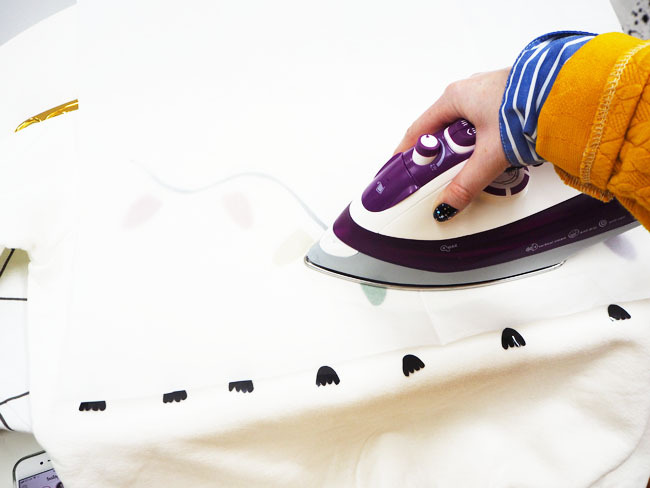 Give your sweatshirt a pre-press with your iron, using the cotton setting (**). This will remove any moisture within the fabric and will allow the vinyl to adhere properly to the fabric. Make sure you keep the steam setting set to OFF throughout. 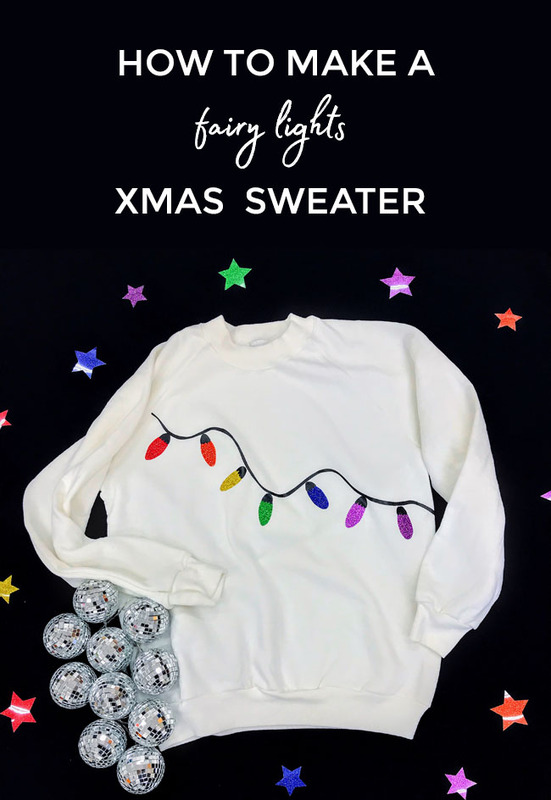 Lay out your black wire line on to the front of the sweatshirt and then begin to place your glittery baubles along it. Don’t forget to add the baubles hats too. Once you are happy with the placement of everything. Take a quick picture to remind you how you laid everything out. Now remove the glittery baubles and bauble hats and place to one side. Cover the black Happyflex wire line with greaseproof paper and begin to press the vinyl with the iron. The shiny side of the vinyl should be facing up. 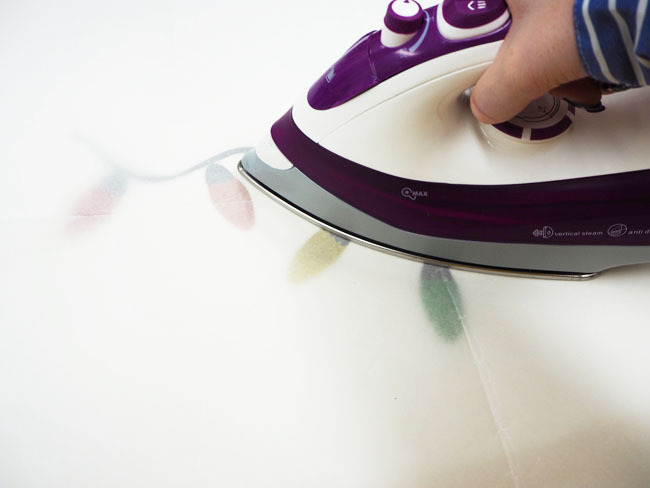 Apply firm pressure to the iron for about 5-10 seconds to make sure the vinyl will adhere to the fabric correctly. Then remove greaseproof paper and remove the plastic carrier from the top of the vinyl (HappyFlex is best peeled back ‘warm’). 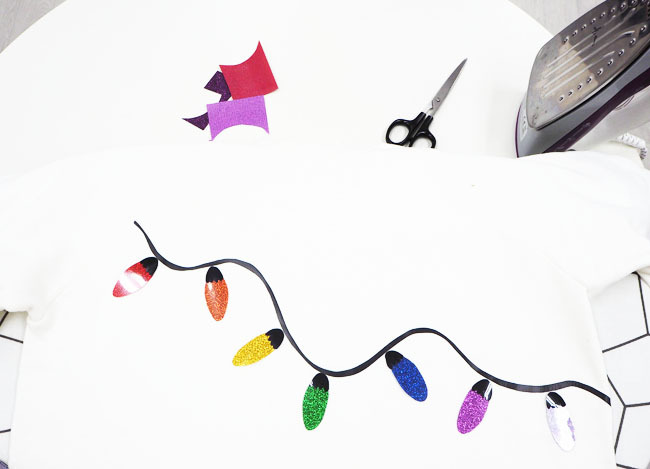 Once the black wire line has been fused and the carrier removed, begin to place your glittery baubles with their hats in place along the line of the wire. I have placed my bauble hat so it is just touching the wire line too look as if it is dangling down from the wire. When you are happy with the placement, remove the bauble hat and leave the glitter bauble part in place. 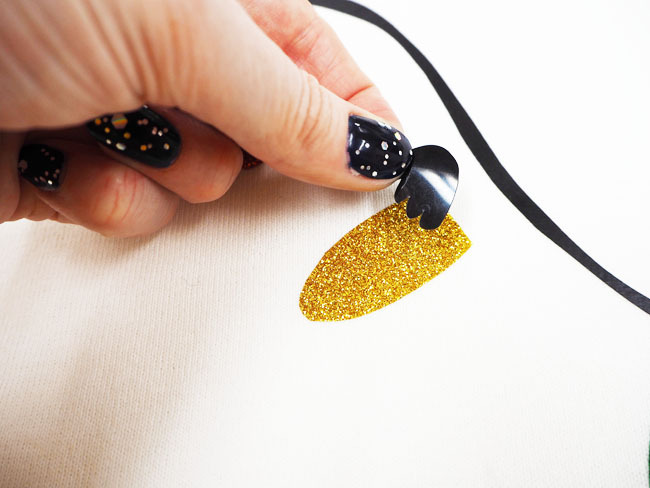 Repeat previous step and fuse your glittery bauble to the sweatshirt. The vinyl should be facing glitter side up (for best results remove HappyGlitter carrier when ‘hot’). Once you have removed the plastic carrier from the glittery bauble place the bauble hat on top and cover with greaseproof paper and begin to press the vinyl with the iron. The shiny side of the vinyl should be facing up. Remove the plastic carriers from the baubles hats. Cover everything with greaseproof paper and give one last press all over your string of baubles with the iron. YAY! You’ve made yourself a gorgeous one of a kind jazzy Christmas jumper! If you want to enter our Xmas Sweater Contest, you can read all about it in our blog post here.